The size of the fonts in this post apparently was hopelessly screwed up by Blogger's software when I dragged and dropped an excerpt from the Federal Reserve's minutes. The post looked fine in draft form but I noticed immediately a problem upon publication which can not now be corrected after several attempts. If you have any trouble reading, I would suggest using the zoom in button in your browser to increase the font size. An article in USAToday last week referred to a UBS estimate that pent-up consumer demand is likely to lead to a 1% increase in consumer spending and a .5% increase in GDP over the next five years. Zacks published an article discussing the two main U.S. low volatility stock ETFs. I own USMV BOUGHT 100 of USMV at $29.29 The gist of the article is that this ETF has shown lower volatility than the S & P 500 and has outperformed the S & P 500 since its inception. I would anticipate that the stocks owned in that fund would of course go down during a market correction, but would expect a smaller decline than a total stock market index and a far lower decline than the high beta and P/E stocks that do not have any dividend support for their stock prices. 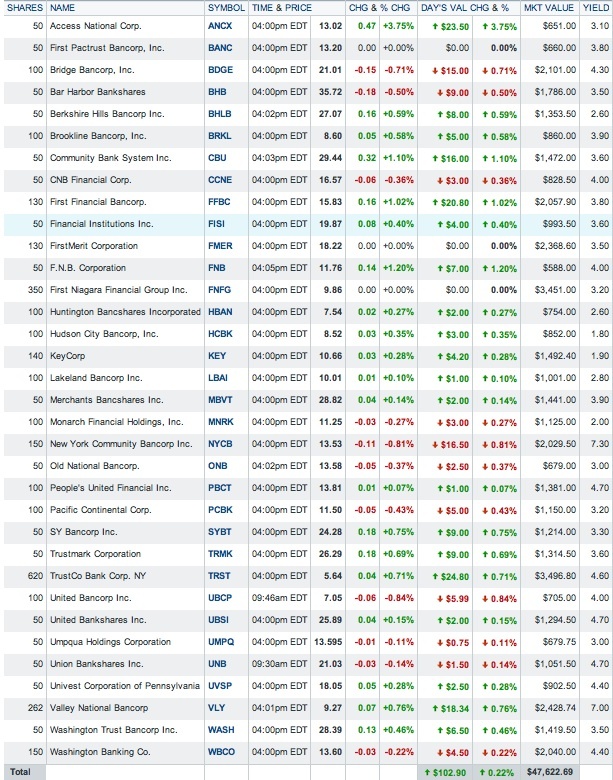 Several of these new ETFs were also discussed in an earlier Zacks.com report. You have to love these American corporations who complain about their tax burden and then find out that they are not even paying any taxes or a lower effective rate than the average senior citizen. A number of stories appeared last week detailing how Apple avoided paying any taxes anywhere on tens of billions of overseas income. WSJ.com A good summary of Apple's tax dodge is explained in this NYT article. The good news is that the Senate subcommittee has exposed Apple's tactic to other corporations who can now copy their tax legerdemains. I read stories all of the time about the ruses used to escape paying taxes. A typical story from Reuters last December detailed how Amazon was using a shell company in Luxembourg and other countries to shuffle money around as a "tax shield" to lower its U.S. tax bill. The IRS was seeking $1.5B in back taxes and Amazon says that everything is kosher. Back in 2004, the large corporations hoodwinked Congress to lower the repatriation tax on cash held overseas in exchange for their promises to use that cash to create jobs. Congress has a way of naming legislation in what sounds appealing only on the surface. Naming legislation is inherently a PR stunt. The legislation granting a reprieve on the repatriation tax was called the America Jobs Creation Act of 2004. Sounds good to me. We can all get behind that title, and congratulate our representatives on another job well done. Last week, Goldman raised its target levels for the S & P 500 to 1,750 this year,1,900 in 2014 and 2,100 by 2015. J.P. Morgan strategists raised their 2013 target to 1,715. The linked article also contains 20 buy recommendations from that firm, none of which are owned by our Beloved Dear Leader Headknocker. The Case Shiller home price index for 20 large metropolitan areas rose 10.9% Y-O-Y in March, the largest gain in seven years, with a number of areas showing strong double digit growth (e.g. L.A. +16.6%; Atlanta +19.1%; Portland +12.8%). WSJ (link to report) Prices are still well below their peak levels from 2006. Markit's U.S. May PMI for manufacturing declined to 51.9 from 52.1, but new orders picked up to 52.8 from 51.5. Initial claims for unemployment for the week ending 5/18 declined 23,000, more than expected, to 340,000. The Dallas Fed reported that manufacturing activity in Texas increased "sharply" in May. This unsecured senior note will mature on 6/19/14 at its $10 par value. Assuming Citigroup survives to pay value on 6/19/14, the worst thing that could happen is another 3% coupon and a small profit on the bonds. A better than 3% YTM on a one year investment grade senior bond probably looks good to a lot of people now. There is a difference however. This security can pay more than a fixed rate coupon bond, a lot more than 3%. Medtronic (MDT) reported its 2013 fiscal 4th quarter earnings at $1.10 per share, seven cents better than the consensus estimate. International sales increased by 7% with emerging market revenues up 15%, both numbers on a constant currency basis. For F/Y 2014, MDT forecasted adjusted E.P.S. of $3.8 to $3.85. This Seeking Alpha discusses the report. Western Asset Global Corporate Defined Opportunity Fund lowered its monthly dividend rate from $.12 per share to $.115. The 30 year bond rose to 3.31% from the prior close of 3.18%. See Discussion in Item # 3 about the impact of what appears to be a minor rate rise on various types of bond funds. I took this snapshot of the quote page just before order entry. On the day of my purchase (5/21), the stock closed at $15.63, down 57 cents for the day or 3.52%. Security Description: TCP Capital is a Business Development Corporation that invests primarily in the debt of of private, middle market companies with enterprise values between $100M and $1.5B. One of the SeekingAlpha contributors who frequently write articles about BDC's has this one at the top of his list. 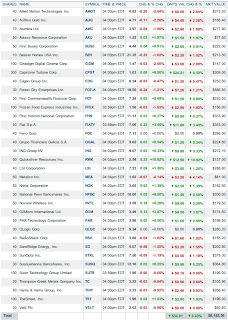 BDC Rankings He focused on this BDC in a March 2013 article published by Seeking Alpha. The discussion is a reasonably good summary and provides some details that I will not mention when discussing a purchase. Last Earnings Report: For the 2013 first quarter, TCP reported net investment income of $.49 per share after preferred share dividends and net of $.15 per share in incentive compensation. 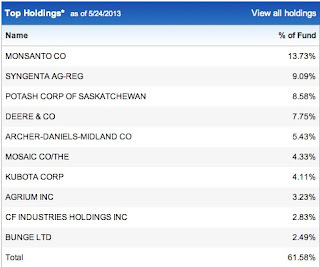 Net asset value per share was reported at $14.91 as of 3/31/13 , up from $14.71 as of 12/31/12. 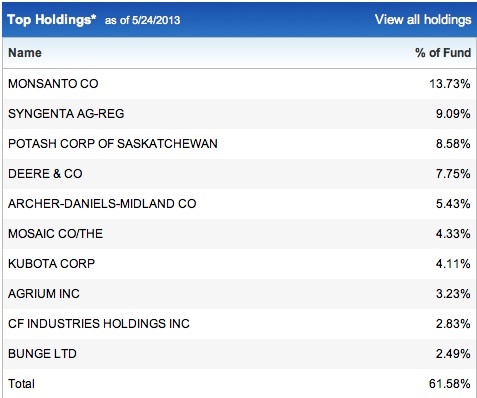 TCP estimated net asset value per share at $15.14 on 4/30/13. At the $.36 regular quarterly rate, the dividend yield would be about 9.2% at a total cost of $15.64 per share. The yield would increase with the payment of any special dividends. Rationale: (1) Tax Free Income Generation in the ROTH IRA: While this BDC has some upside potential on the share price, the primary reason for buying it is to generate a high level of tax free income paid into the ROTH IRA. Of course, the dividend would be taxable when the shares are purchased in a taxable account and become, in effect, tax free dividends when paid into my ROTH IRA. I feel a need to make that point in case someone reads that sentence and interprets it in an obviously incorrect and boneheaded manner. As noted in many posts dealing with BDC purchases in the IRA, I am primarily interested in capturing a few quarterly dividend payments, possibly up to two years, and then exit the position for whatever profit is available hoping to generate an annualized tax free return of 10+% which is easier to accomplish when the dividend is providing 9.2% of that return and the stock gain really just needs to be a percent or two in the green. Risks: I have discussed the risks of BDCs throughout this blog. Needless to say, there is no free lunch for a 9.2% yield. One risk is highlighted by what happened to the stock price on the day of my purchase, a decline of over 3% precipitated by a share offering that is a common event among BDCs. BDCs lend money to high risk credits. BDCs, like REITs, have to pay out 90% of their net income to shareholders as dividends, and will consequently avoid double taxation for those distributions. By avoiding double taxation, the dividend will be higher than a typical C corporation that is taxed on the income before distributions to their shareholders. The problem is that the BDC is not keeping capital to grow and will frequently find that the capital growth path is through more and more share issuances. Future Buys: I will typically consider adding to BDC positions on downdrafts, which will occur after the company announces the sale of shares, and I will probably add to this one at a lower price. 2. Added 50 GHY at $18.30-Taxable Account (see Disclaimer): The Prudential Global Short Duration High Yield Fund is a leveraged closed end fund that invests in short term junk bonds both foreign and domestic. Bonds were plastered in yesterday's action. I have recently discussed this fund when making two odd lot buys. The longer discussion can be found in Item # 3 Bought 50 of the Bond CEF GHY at $18.77-Roth IRA (4/9/13 Post). The net asset value per share was then $19.02 and the discount was -.53. I later initiated a position in a taxable account. 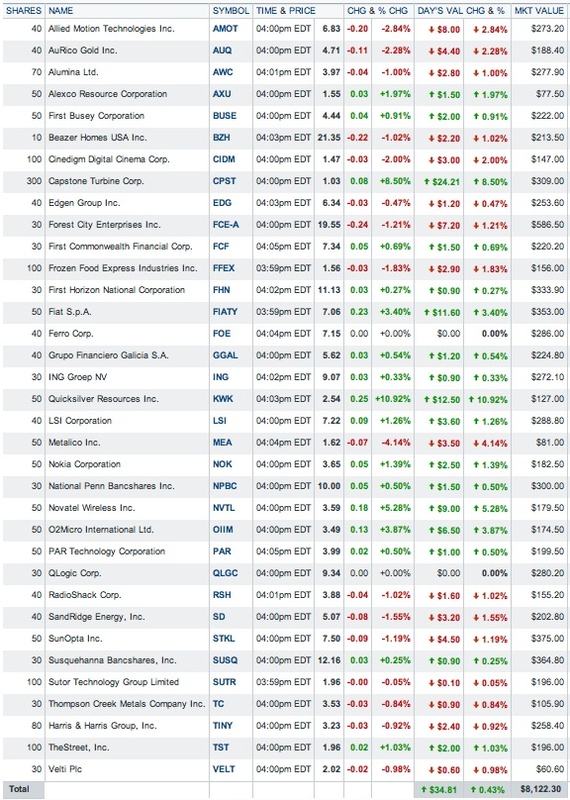 Item # 5 Added 50 GHY at $18.55 (4/30/2013). At that time, the net asset value per share was $19.07 and the discount was then -3.15. As noted previously, this fund is paying a monthly dividend at $.125 per share. Since this is a new fund, I do not know for certain whether that dividend can be supported without a return of capital. I believe that the fund will need some capital gains to avoid a return of capital. On my day of purchase, the shares fell $.2 or 1.08% while the net asset value per share remained constant. The foregoing data points highlight one risk associated with CEFs. The net asset value per share could be going up as the market price declines, creating a larger discount to net asset value. While the stock price took a hit, the net asset value per share closed at $19.06 yesterday, unchanged from the prior close. At this point in time, any profit realized on a bond fund is viewed as a victory. The total return would be $150.23 on a total cost of $2,136.63 or 7.03%. The holding period included 11 monthly dividend payments so the annualized 12 month return would be slightly better. For this bond CEF, unlike GHY above, the market price rose 4 cents per share as the net asset value declined by 26 cents per share. Interest Rate Risk and Duration: The first page of this article published by First Trust shows the hypothetical losses for different types of bonds with a 1% rise in interest rates. 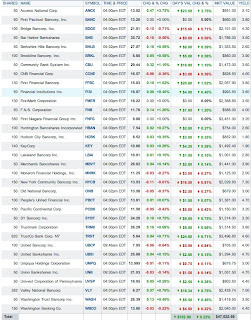 ftportfolios.com/PDF The worst performers would be long term bonds which would include BABs. Until the rise in rates actually happens, of course, an investor will not know the precise loss amount. Just to get an idea for planning purposes of a potential loss range, I multiply the duration by the percentage rise in interest rates. I did not come up with that number myself, but simply borrowed it from a number of publications, notably this illustration from Vanguard and an article published by FINRA. A recent article published by Seeking Alpha explores the topic in relation to treasury securities. That does not look so bad? "Participants also touched on the conditions under which it might be appropriate to change the pace of asset purchases. Most observed that the outlook for the labor market had shown progress since the program was started in September, but many of these participants indicated that continued progress, more confidence in the outlook, or diminished downside risks would be required before slowing the pace of purchases would become appropriate. A number of participants expressed willingness to adjust the flow of purchases downward as early as the June meeting if the economic information received by that time showed evidence of sufficiently strong and sustained growth; however, views differed about what evidence would be necessary and the likelihood of that outcome. One participant preferred to begin decreasing the rate of purchases immediately, while another participant preferred to add more monetary accommodation at the current meeting and mentioned that the Committee had several other tools it could potentially use to do so. Most participants emphasized that it was important for the Committee to be prepared to adjust the pace of its purchases up or down as needed to align the degree of policy accommodation with changes in the outlook for the labor market and inflation as well as the extent of progress toward the Committee's economic objectives. Regarding the composition of purchases, one participant expressed the view that, in light of the substantial improvement in the housing market and to avoid further credit allocation across sectors of the economy, the Committee should start to shift any asset purchases away from MBS and toward Treasury securities." 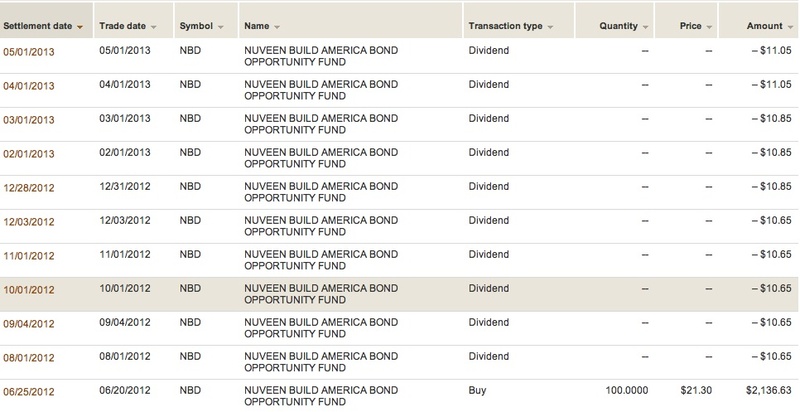 I still own 150 shares of the functionally equivalent Nuveen BABs CEF NBB. Fifty of those shares are held in the ROTH IRA. Item # 1 Bought 50 NBB at $20.73-ROTH IRA July 2012. As noted in that post, with three snapshots provided, I have traded that BABs CEF on multiple occasions for a total profit of $184.16, Sold 100 NBB at $20.13-ROTH IRA November 2011; Added 50 NBB at $19.55 in the ROTH IRA September 2001; Sold 100 NBB at $20.07 November 2011; Bought Back 50 NBB @ $18.4 in IRA December 2010; Sold 50 NBB @ $19.24 in the Regular IRA December 2010; Bought 50 NBB at $19.67 June 2010. 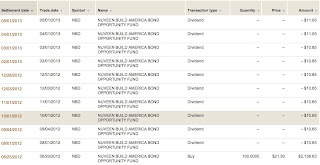 Both NBB and NBD are leveraged CEFs sponsored by Nuveen and pay monthly dividends. Both funds will liquidate on or about 12/31/2020. This BDC is discussed in an article published by Seeking Alpha last March. Later in April, as noted in Brendan Conway's Barrons.com blog, the analysts at Wells Fargo downgraded New Mountain to neutral from outperform based on that price run up and the risk of a near term capital raise. Their 2013 valuation range was then $15.5 to $16.5. New Mountain recently declared a $.34 per share quarterly dividend. At that rate, the dividend yield would be about 9.05% at a total cost of $15.03. The quarterly dividend has remained at $.34 since the first regular payment in the 2012 second quarter. A special dividend of $.14 per share was paid in the 2012 4th quarter. I took a snapshot of the investment categories as of 3/31/13, which shows that first and second liens together constituted 94% of the firm's investments. A summary of the investments can be found in the last filed SEC Form 10-Q starting at page 6. Rationale: The rationale is the usual one for small BDC investments in an IRA. I am hoping to realized a tax free 10% annualized return, with the dividend providing the bulk of that return. I only need to exit the position with a small profit on the shares to achieve that objective. I would classify this investment as successful after collecting 4 quarterly dividend payments and a disposition of the stock at over $15.5 per share shortly thereafter. If the stock hit the upper end of the WFC target range of $16.5, then that would likely be the best scenario since I view BDC capital appreciation to be generally limited considering the compensation paid to the managers, the risks inherent in the loans, the large dividend payout ratio and the constant stream of stock offerings. Risks: The risks are the normal ones for BDCs, as outlined above in connection with the TCP Capital purchase and elsewhere in this blog. While New Mountain's debt portfolio is mostly first and second lien, the Wells Fargo downgrade summarized above noted that more subordinated loans were being made, which are more risky but carry higher yields. New Mountain discusses the risks associated with its business, starting at page 25 of its last filed Annual Report and continuing until page 57. A twenty-two page description of risks is not something to be ignored by potential investors. It is like the warnings on some prescription medications. After reading the warning, the medicine might be far worse than the ailment that it allegedly treats. I would also note that second lien debt can be more risky than the name implies when the first lien is large and the debtor's business has failed for whatever reason. When Reddy Ice went bankrupt, I owned 1 second lien bond that was exchanged for 43 shares of new common stock now traded infrequently on the Grey Market. In that example, the first lien bond was much larger at $300M than the second lien at 139+M. I am only going to discuss this stock ETF briefly. A recent article published by the ETF Database compared the agricultural ETFs and found that VEGI had the lowest cost with a .39% expense ratio and had outperformed the others over the trailing 12 month period. Security Description: The iShares MSCI Global Agriculture Producers Fund is, as it name explicitly states, is a global stock ETF that owns agricultural companies. I had some negative comments about fertilizer companies several months ago that precipitated this pared trade: Item # 2 Sold 50 SOIL at $14.59 & bought GYLD I noted in that section two recent negative articles about fertilizer producers including this one published originally by Morningstar and republished at Seeking Alpha. The Census has a nice clock that shows the current estimate and the numbers being added each second. Population Clock The U.S. population is rapidly approaching 316M. Risks: There are always additional risks to sector ETFs that do not apply to broad based ETFs like VTI which owns over 3,000 U.S. stocks covering every industry sector. A sector bet may not work out, even as the major market indexes continue to advance. A sector may contain a number of stocks that drag down the performance which has been the case with VEGI over the past several months as the fertilizer stocks declined in price. There is some currency risks associated with owning any foreign company. The USD has been rising in value against most major currencies which is a negative for a U.S. ETF that owns foreign stocks priced in those depreciating currencies. And it is not necessary to explain that there are risks to stock ETFs in general, particularly when there has already been a tremendous move since March 2009 of almost 150% in the S & P 500. Future Buys: I will take another look at this one when and if the share price falls below $25. The weekly post will be published on Wednesday. I have barely started writing it. Both the Regional Bank and Lottery Ticket Basket strategies are updated on the last Monday of each month. The prices shown in the following tables are from last Friday. My basket strategies will have a large number of securities in them. The focus is on the overall return of the basket rather than on any component. The total current investment is less than $7,000. The leading unrealized gain is in Forest City. The leading loser continues to be Velti. A. Sold 40 BNCN at $10.02 (see Disclaimer): I simply decided to harvest a good percentage gain in this small N.C. based bank. B. Sold 50 SIMG at $5.41 (see Disclaimer): It is okay to buy a stock in the LT strategy even though there is at best a woefully inadequate understanding of the firm's products, which is the case with SIMG for me. The selection can solely be based on statistical criteria. The stock rallied some after SIMG's recent earnings report, where the company reported a 13% Y-O-Y increase in earnings, a $.01 per share GAAP loss and a $.04 per non-GAAP profit. SEC Filed Press Release; Earnings Call Transcript - Seeking Alpha. SIMG beat the consensus forecast for earnings and revenues. The stock did rise some after that announcement so I sold it. I am from the old school, so I find it difficult to become excited by a $.01 GAAP loss per share. I will use not use non-GAAP earnings that simply exclude recurring expense items such as stock options. I will use non-GAAP where the GAAP earnings took a one quarter hit from an item such as merger related expenses. An example would be the recent earnings release from Berkshire Hills Bancorp (BHLB) discussed below in the regional bank basket section. However, if there is a write-off later on from an acquisition, such as what HP routinely does, then I will look only at the GAAP numbers. I am not going to allow a company to focus my attention on non-GAAP earnings when write-offs are destroying shareholder value. C. Sold 30 BYD at $12.68 (see Disclaimer): Boyd Gaming owns and operates casinos. Profile | Reuters.com I mentioned in my last update of this basket strategy that BYD shares had popped after Morgan Stanley had upgraded the stock to outperform, with a $12 price target, and the company reported better than expected earnings. The adjusted E.P.S. number was 1 cent. The GAAP E.P.S. was a negative 8 cents per share. Hard for even the RB to get too excited by that report. Q1-2013 8-K For virtually the entire period of ownership, starting in November 2010, I had an unrealized net loss based on my $9.78 purchase price. The price had slipped on occasion below $6. BYD Interactive Chart I now have a realized gain of $71.09. Okay, it is not going to pay for my nursing home expenses. D. Sutor Technology (SUTR): Sutor is my only remaining Chinese small cap after I successfully exited Xinyuan Real Estate. Sold 100 XIN at $5.82 For a long time, I was in a deep percentage hole with my 100 share position until the stock started a 100% move from a $.96 share close on 1/24/13 to its current price. SUTR Historical Prices A casual observer would naturally assume that a 100+% rise would at least bring me into profit territory which would not be the case with this stock. I have had other examples of larger gains in my Lottery Ticket basket which only narrowed my percentage loss. This is sort of an inherent problem in a falling knife strategy. While I did manage to harvest a 100+% total return in XIN, it took a 100% rise in SUTR to bring me somewhat closer to break-even. I need another 100% burst, and it would probably be advisable to refrain from spending a profit on this position until I actually see one. Sa La Vie. The stock had managed to work its way back up to $1.72 on 5/10/13. Sutor released its fiscal third quarter earnings report on May 13, 2013 and the stock rose to $2.05 on that day, which does not sound like much, except that it is a 19.18% rise on a percentage basis. Subsequently, the shares have floated back down to near the pre-earnings close. Sutor is a Chinese manufacturer and distributor of "high-end finished steel products and welded steel pipes"
Sutor Technology reported a 27% Y-O-Y revenue increase to $139.5M and a 233.3% increase in its E.P.S to $.1 per share. Only one analyst provides earnings estimates. The estimate from that analyst is for an E.P.S. of $.36 in the F/Y ending in June 2013 and $.45 in the 2014 F/Y. I would add that many American investors simply do not trust the accounting generated by Chinese companies, particularly the small ones. I have no opinion about SUTR's accounting and would not be qualified to render an opinion anyway. For the first quarter, DTLK reported GAAP E.P.S. of 6 cents, down from 12 cents in the year ago quarter. The adjusted non-GAAP E.P.S. was $.18, up from $.17. I decided to harvest a good percentage gain. Needless to say, the dividend yield for each position is higher than the 2.01% yield on the 10 year treasury as of last Friday's close. Standard Chart - WSJ.com Most of the dividend yields are higher than the 3.17% yield on the 30 year treasury (Standard Chart - WSJ.com), and many of these banks are raising their dividends. A buyer of that 30 year treasury bond with a 3.17% is stuck with that yield until the bond is sold. The only new position since the last update was Access National (ANCX): Bought 50 ANCX at $12.11 (4/30/13 Post) All of my recent adds have been in micro caps with less than 200M market capitalizations, since I view virtually all of the larger banks to be either fairly valued or slightly overvalued based on forward estimated 12 month earnings. Most of these regional banks, including the best managed ones, have been suffering net interest margin compressions for several quarters Y-O-Y, a trend expected to continue until the FED ends ZIRP. E.P.S. is likely to either decline or increase slightly in 2013 and 2014. Some of the banks in my basket may buck that trend due to the benefits flowing from recent acquisitions, but that remains to be seen. FMER, for example, recently completed a large acquisition and the consensus forecast is for an E.P.S. of $1.29 in 2013 and $1.42 in 2014. FMER Analyst Estimates The share price of FMER, however, has already moved up from a $15.55 close on 4/22/13, adjusted for the recent quarterly dividend, to $18.22 last Friday, a 17.17% spurt in slightly more than a month. The forward P/E on estimated 2014 earnings is 12.83 based on the $18.22 price, but the trailing P/E is 14.35. Generally, for well run banks, a trailing multiple of 15 is at the top end of my fair value range. There could be an earnings growth spurt when loan demand accelerates, loan losses stay at low levels and the net interest margin expands to normal market levels after the FED ends ZIRP. The unrealized gain in my regional bank basket, after that RNST profit, is close to $3,850. Almost all of the positions increased some in value since the last update. Some of the leading gainers include FMER (+$174.2); FNFG (+$178.5); TRST (+$241.8); KEY (+$120.4); SYBT (+$112); MNRK (+$119); several up in the +$50 to +$100 range (e.g. BDGE, LBAI, BANC,WASH, VLY, PBCT, PCBK, TRMK, UMPQ); and importantly no significant detractors which is always important in a basket strategy. It obviously does not help to have six decliners canceling out the six top gainers. Snapshots of trades can be found in the above referenced Gateway Post. A third party service calculated BHB's Texas Ratio at 9.19 as of 3/31/13, one of the lowest. E. Monarch Financial: Monarch Financial announced a 20% increase in its quarterly dividend to 6 cents per share. I currently own 100 shares and have booked one gain of $186.06. F. Umpqua: Possibly, this is not the best possible name for a bank. Umpqua Holdings Announces Special Dividend and 50% Increase in Quarterly Dividend The new quarterly dividend rate will be 15 cents per share. The special dividend is $.05 per share. G. Valley National (VLY): Valley is now my largest dollar loser in this basket, and a weak hold based on forecasted earnings for 2013 and 2014. Valley National did declare its regular quarterly dividend of $.1625 per share. The payout ratio is slightly over 100%. Valley National Dividend Information I have not reinvested the dividend to buy more shares. The last earnings report was a disappointment. The bank reported an E.P.S. for the 2013 first quarter of 16 cents per share, down from 18 cents in the 2012 first quarter. Given the sluggish earnings, I would not be surprised by a dividend cut unless earnings growth can be restored relatively soon. The unrealized loss is close to $850. VLY has issued 5% stock dividends during my ownership period. I see no reason whatsoever for stock dividends or splits on a stock trading in the single digits.